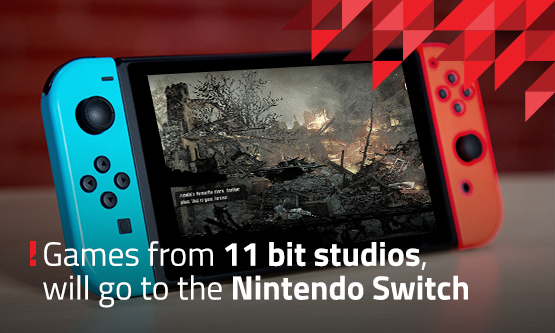 This War of Mine, Beat Cop, Moonlighter and Children of Morta are the four titles in 11 bit studios S.A. portfolio slated to launch on Nintendo Switch consoles in the coming months. “Our strategy is to monetise the games we develop and publish across platforms, if doing so is economically viable, of course. Nintendo Switch consoles are a very promising and fast-growing segment of the gaming market, and we want to have a presence there,” says Grzegorz Miechowski, President of the Management Board of 11 bit studios S.A. According to the latest data published by Sony, as at the end of July fans had bought almost 20 million Nintendo Switch units in just 15 months. This War of Mine, an iconic game that provides an experience of war from a civilian angle, will be brought to Nintendo Switch in November 2018. The Nintendo Switch version of TWoM, featuring all the previously released extensions and paid DLCs, will be prepared by our fellow studio Crunching Koalas, based in Warsaw. The Nintendo Switch edition of TWoM will be available in boxed and digital versions. The boxed version will be distributed by Koch Media (Deep Silver), the publisher of TWoM for Xbox One and PS4. Beat Cop and Moonlighter, published by 11 bit studios, are also scheduled for release on Switch this year. ‘Beat Cop will also be converted to Nintendo Switch by Crunching Koalas, and Moonlighter will be ported independently by its developer, Digital Sun,” Miechowski explains. The Nintendo Switch edition of Children of Morta will also be prepared by the developer, Dead Mage. The release for PC, Xbox One and PS4 consoles is planned in the coming months. 11 bit studios S.A. is the publisher of Children of Morta. The Nintendo Switch version of the game will be released in the first months of 2019. “Both this title and Moonlighter will be available on Nintendo Switch in both digital and boxed edition,” Miechowski adds.